A popular Korean barbecue joint in Flushing, Queens aims to open an outpost on St. Marks Place next month. Co-owner Daeyoung Kim said that construction of the East Village location of Han Joo is on schedule, but that he was still waiting on an assortment of city permits. Previously, a sock shop named Sox in the City occupied the space at 12 St. Marks Place. 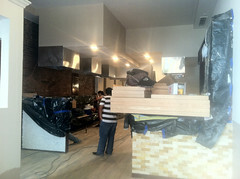 Taking a break from building the restaurant, Mr. Kim touted the Flushing location’s reputation, noting its crystal grill, and the naeng-myun cold noodle soup. The latter is the restaurant’s specialty, though an assortment of reviews rave about the grilled pork belly. “It’s really famous,” Mr. Kim said of the restaurant that opened in 2001.